You don't mess with the Battousai. In the turbulent years of the Meiji Restoration, one man slashed open Japan’s path toward a new era. That man, Himura Kenshin, was the feared assassin known as Hitokiri Battousai. However, Kenshin grew to have an immense distaste for killing, and permanently sheathed his sword after the conflict, opting for the non-lethal sakabatou and travels Japan as a wanderer for ten years. As fate would have it, Kenshin wanders into an unassuming kenjutsu dojo in Tokyo. Rurouni Kenshin (るろうに剣心）, based on the manga of the same name by Watsuki Nobuhiro, could very well be the single most popular anime ever made. As it is, the anime industry is not on any shortage of those representing the samurai genre. Nonetheless, I can almost guarantee that no matter what the show is (i.e. Samurai Champloo), it will be compared to (perhaps unfairly so) to Rurouni Kenshin. A very significant part of the appeal lends itself to the characters. Kenshin himself is a very well-rounded character. At times showing extreme wisdom, at times a total goof, Kenshin is always an interesting character to watch, as are the allies and enemies he meets over the course of RuroKen’s 95 episodes. It is also good seeing certain antagonists resurface in later episodes, despite having been seemingly defeated in their own arcs. This shows that RuroKen doesn’t fall into the trap that Spice and Wolf II did by just dropping characters as soon as they outlived their usefulness. The problem with RuroKen was that the series wasn’t very consistently good in terms of episode quality. The series is divided into three seasons. The first is mainly dedicated to introducing Kenshin as well as the other major characters of the anime like Kaoru and Sanosuke. Unfortunately, there were more than a few filler episodes, especially toward the end of the series. However, RuroKen really reached its peak during the second season, when the Shishio arc took place. At that time, Kenshin, as well as much of the early Meiji Japan setting, got some long overdue development. In addition, Shishio was simply one of the best villains to have come out of the anime industry. Shishio had a very unusual amount of depth, and he was almost as interesting to watch as Kenshin, mainly because of how important his personal philosophy was. Unfortunately, RuroKen’s storylines took a nosedive for the worse at the conclusion of the Shishio saga. The problem was that the anime had caught up to Watsuki’s manga. While Watsuki went about writing the Jinchu arc (Which, as of yet, has not had a proper animated adaptation. No, the Seiso-hen OVA does not count.) the anime writers just went wild banging out one lame arc after another with equally lackluster filler episodes in between. You can tell the writers wanted Amakusa Shougo, a crazy Christian who mastered Kenshin’s sword style, to be another Shishio, but he fell way short of the mark. This was followed up by the absolutely pathetic Beni-Aoi story. The problem was that the last episode of the Shishio saga actually was a very legitimate ending, so the series easily could have stopped right there. This seemed like an unfortunate case of the studio just trying to milk RuroKen (let me reiterate, possibly one of the most popular anime ever) for all its worth. The animation is definitely very good for a televised anime series. The first season had pretty artwork, but the visuals took a dramatic turn for the better in the second one. 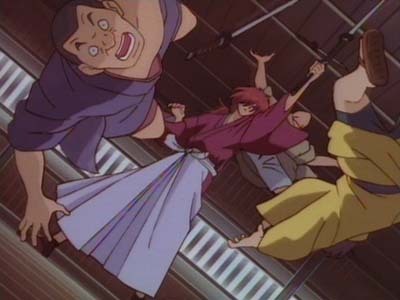 While the Kenshin/Saito fight in an early episode looked fantastic, the animators appeared to have been saving all their tricks for the climactic fight. Furuhashi Kazuhiro, director of You’re Under Arrest!, did a great job of capturing Watsuki’s vision. Moreover, Watsuki had created some really pretty character designs, so RuroKen is definitely a treat for the eyes. Visually, the only thing I didn’t like was how the animators started using CG fairly liberally in the later episodes. In one instance, a character was walking along a river with the moonlight shining down upon the river. This resulted in the moonlight being reflected by the water onto the character. The effect didn’t look bad, but it seemed out of place considering how RuroKen had largely avoided computer graphics up until then. Rurouni Kenshin had probably one of the best soundtracks I have ever heard. Asakura Noriyuki created fantastic, catchy themes. While some of them seemed to have been repeated a few times too many, particularly by season 3, I never really tired of the music. After every arc or so, RuroKen changed up the ending theme. My favorite, by and far, was Bonnie Pink’s “It’s Gonna Rain”. The voice acting was also good for the series. Granted, some of the actors probably overacted a bit, but overall it worked nicely. Suzukaze Mayo appeared to have been a one-hit wonder in her role as Kenshin. As her performance was very good, I’m surprised she hasn’t gotten any other voice work later on. I just need to give you one big warning. Before going into Rurouni Kenshin, you might want to arm yourself with a good understanding of Japanese culture and history, preferably with a working knowledge of the Japanese language. Try as Media Blasters’ subtitles might, they simply fail to capture the meaning Kenshin’s verbal tics (Particularly his use of “de gozaru” instead of “desu” or “da”). Nonetheless, Rurouni Kenshin has its place in the most successful anime series of all time, and rightfully so. Sure, it wasn’t a perfect series, but it had more than enough appeal in the areas in which it excelled to make it a winner. It is only unfortunate that the series wound up with the utterly lame post-Shishio episodes. Still, I wholeheartedly encourage every self-respecting otaku to pick up Rurouni Kenshin. Then at the conclusion of the Shishio arc, you should watch the absolutely amazing Tsuioku-hen OVA to see how everything made sense. NOTE: Avoid both the English dubs like the plague. There was the infamous Sony dub for the European market where Rurouni Kenshin was known as Samurai X. There, the actors did a great job demonstrating how much trouble they had with characters’ names, and it seemed like characters had their names changed (like Yahiko to Yoshi) purely to make the lives of the actors a little easier. The Media Blasters dub (what was televised in America and is on the DVDs) at least tried to maintain the essence of the Japanese by keeping the names intact, but a lot still wound up simply getting lost in translation as somethings just don’t have English equivalents. Well, the voice-acting itself was also kind of lame. Considering what a “Japanese” anime RuroKen is, you’re probably watching the original Japanese language version anyway. Also, I absolutely HATE the DVDs on which Rurouni Kenshin was released in the United States. RuroKen was licensed by the now defunct Anime Works in the United States. As it is, the discs didn’t contain more than 3 or 4 episodes a pop. While I bought the Economy box sets, which each contained a season, it was pretty obvious Anime Works wanted people to buy the discs individually. For one thing, the discs weren’t numbered (Disc 1, Disc 2, etc.). While Season 1 had the discs arranged on pages, the other two had all discs on a single spool. I actually had to use the disc serial numbers to keep them in order. To top it off, I was less than impressed with the quality of the transfer. On my television, the titles in the opening credits look rather pixelated while other instances just show a rather obvious low resolution. Just about every other anime DVD I purchased looks better than RuroKen does. I think it’s a shame such a great series wound up on such poor quality (and when they first came out, highly overpriced) DVDs.